How do people in Britain use the internet? How do they behave online? The new Digital Anthropology Report. The Six Tribes of Homo Digitalis gives some answers. The British communication company Talk Talk sent researchers from the University of Kent into the homes of people around the UK to ask them questions about their attitudes towards digital technology and to watch them use it. They also commissioned anthropology professor David Zeitlyn to analyse the findings. 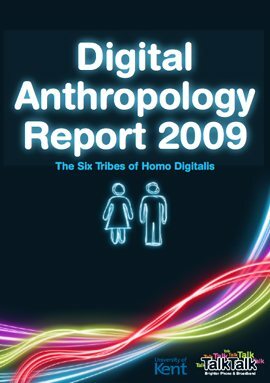 They found that “homo digitalis” consists of Six Tribes with very different attitudes, usage patterns and modes of behaviour. Some of these tribes have embraced technology and put it at the centre of their lives. For other tribes, “the internet” is a rather frightening jungle. The E-ager Beavers are the largest tribe by quite a distance, with 29% of the UK adult population. They use the internet heavily, but they are more passive users. They lack the confidence or the drive to get involved with uploading their own content or producing their own blogs. The Timid Technophobes are the second largest group (23%). They have only limited internet skills and will only use it when they really need to. They still prefer to use pen and paper and prefer to send and receive letters. They don’t read blogs and are not interested in facebook either. The tribe of the Digital Extroverts (9%) consists of people who are “always-on". They are active bloggers, use twitter, flickr etc. “Regularly updating their online profile is as much a part of their daily routine as eating.” The ability to interconnect and share data is a prerequisite. According to Zeitlyn, your willingness to embrace technology and integrate it into your life will dictate your success in life far more than your social class will. As class structures change quickly, he writes in his analysis, the extent to which people use social networking and promote themselves online will become more important in determining their careers than what school or university they went to. Microsoft anthropologist: Let people be online at work or risk losing stuff!